7-year-old Ella spent the holiday season raising money to help find a cure for cancer by selling Christmas ornaments. After initially hoping to raise $100, she blew past her goal, eventually topping $400. We talked with Ella about what motivated her to take time out from celebrating with friends and family in order to help others. Here’s what she had to say. What made you want to do something to help cure cancer? I wanted to do something to help people with cancer get better. It makes me sad to see people sick from cancer. How did you come up with the idea to sell Christmas ornaments? The idea to make ornaments was easy. I like making things and decorating and it was the Christmas season. It just went together! How did you feel after you raised over $400? My first goal was to raise $100. I didn’t think I would reach that goal at first. People kept buying ornaments! When I heard I raised over $400 I was so surprised and proud! It motivated me to raise even more next year!!!! I learned a few things from doing this. I learned that many people are generous and supportive. I also learned that even though I am young I can do big things! So, you’ve already decided you are going to sell ornaments again next year? Yes, I plan on selling ornaments again next year! I am already trying to figure out what kind I should make. Thank you to Ella and to everyone else that give their time and money in the effort to cure cancer. 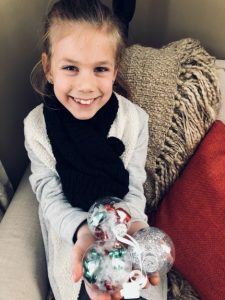 2 Comments on "7-Year-Old Ella Wanted To Cure Cancer For Christmas, So She Raised Money Selling Ornaments"
Way to go Ella! God has great things in store for you. You have a beautiful generous heart! Way to go every dollar counts.